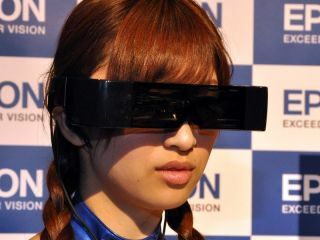 Epson has unveiled the latest 3D head-mounted display to enter the world of home entertainment – the Moverio. The headset is essentially a pair of glasses that have been packed with so much innovation that they are extraordinarily big. First up, the headset has two 0.52-inch displays, which have been made from transparent lenses. The reason for this is that you still have a sense of your surroundings while you wear the device – and we're guessing you can get on with some augmented reality action as well. Each screen is a so-so 960 x 540 pixels but toegether they create an illusion of watching a 320-inch screen from a 20-metre viewing distance. The glasses are connected to a device which uses Android 2.2 and has Wi-Fi on board as well as 1GB storage, microSD card compatibility and around six hours of battery life. The Moverio BT-100 comes hot on the heels of the Sony Personal 3D Viewer, which garnered a mixed reception from TechRadar when it was shown of at IFA 2011. Two devices don't make a category but we're expecting a few more HMD (head-mounted devices) to be launched at CES 2012. As for a Moverio BT-100 release date, it will be out 25 November in Japan for 50,000 Yen (£320).